There’s a very good reason why some classic children’s toys have stood the test of time and seen other more faddy children’s toys fall by the wayside. The most enduring traditional toys usually have a wide appeal – some appeal to parents just as much as their offspring (like dolls and other Victorian toys) while most dads can see the appeal of a train set or Scalextric toys! Classic toys usually become classics because they give children a chance to explore, experiment, learn, and have fun at the same time. Most traditional, well loved toys also let children take the initiative in how they play with them, giving them plenty of scope to do their own thing. Some classic toys just have a retro appeal that appeals across the generations, and simply never go out of fashion – like Lego sets and teddy bears. Another benefit to traditional and classic toys is that they may even be worth something in years to come. Every little girl wants a dolls house, and to be honest, most of their mothers are only too keen to oblige. So what is the enduring appeal of this classic toy? Dolls houses haven’t always been just for children. The earliest recorded dolls house was a miniature replica of the house of a German prince made in the 1560s, designed for him to show off his lifestyle and possessions. He didn’t even give it to his daughter to play with – he got bored of it and gave it to a museum! Whether you want a modern style dolls' house, or perhaps an older-style? Do you prefer a plastic or wooden dolls house? As classic toys go, soft toys tend to be universally loved, by boys and girls alike. Of course they are quickly grown out of ‘officially’ but we probably all admit to having a favourite soft toy still stashed away from our childhood. If you’re looking for classic toys that will stand the test to time, go for a durable soft toy that’s well made and not just this year’s phase. You may well see your investment passed on to the grandchildren...or in toy museums. Kids have been creating masterpieces from traditional toys like Lego and Meccano (and usually fighting over them, too) for generations. 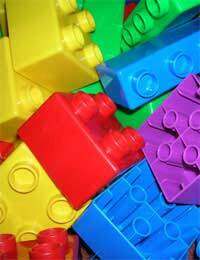 The reason for these children's toys constant popularity is that they stimulate children’s imaginations – there are endless variations on the designs your child can come up with using some brightly coloured plastic bricks or pieces of metal. The manufacturers tend to keep their ranges updated, too, creating a new appeal for classic toys by keeping up to date with trends and incorporating them into well-loved sets. The Slinky A Slinky is a coil shaped children's toy that walks down steps with the aid of clever design and gravity. They may not keep the kids amused for long, but we’ve all had one! Outdoor retro toys - Frisbees, skipping ropes, hula hoops and other playground toys – these will never go out of fashion, because they are just so much fun! Retro board games and indoor games Connect Four, Operation, Monopoly, and Yahtzee – all simple classic toys that kids never seem to tire of – and remind their parents of when they were young!